TRAINING DAY: Prime Minister Scott Morrison avoided protesters ahead of a $2 billion announcement for fast rail to Melbourne. 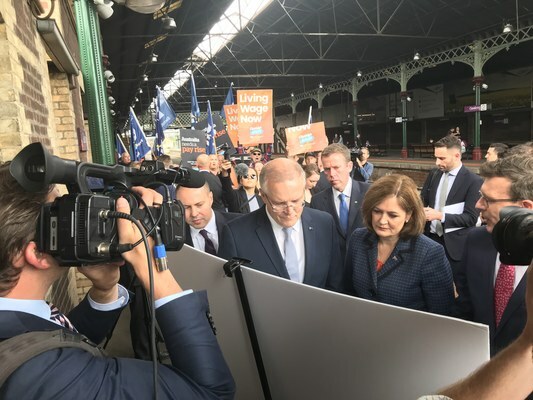 Prime Minister Scott Morrison dodged protesters on Friday morning at Geelong Railway Station on his way to announce $2 billion for fast rail to Melbourne. Mr Morrison snuck through an alternative entrance to avoid waiting union protestors before accusing the group of attempting to disrupt the event. “I just heard them chanting union power, union power, union power that’s what the future of this country looks like under a Shorten government,” Mr Morrison said. The nation-first project would see trains reach speeds up to 200km/h, slashing commuters’ journey from Geelong to Melbourne by half, Mr Morrison said. He described the proposal as “one of the most significant regional rail infrastructure projects that Victoria has seen”. “The opportunity for a half-hour rail trip between Geelong and Melbourne will change not only Geelong and Corangamite but it will also change Melbourne itself,” Mr Morrison said. Construction of the project would begin within 18 months and be completed by 2030, according to government. Mr Morrison said the investment would allow Geelong and Corangamite residents to make “real choices”. “You can’t get a fast rail on drive-through, this is not a fast food process we’re engaged in here. Corangamite MP Sarah Henderson said the announcement was a “game changer”. “This is an incredible day for Geelong, Corangamite and the entire south-west of Victoria,” the Liberal MP said. Geelong’s council has allocated $100,000 over two years to develop a Fast Rail strategy document.